Manicures and pedicures are some of the most popular spa treatments available today. As an owner of a spa, you probably know just how much your clients appreciate a good pedicure. That’s because the treatment doesn’t just keep the nails and feet in good condition, but it also helps them relax and let go of their stress. As a spa owner, you want to do everything in your power to help them relax, and getting great spa pedicure chairs is a good way to do that. Why is It Important to Choose a Right Pedicure Chair? The beauty industry is highly competitive, but it also has customers that are the most loyal. What we mean by this is that if a client finds a spa that she likes, she’s going to stick to the same spa unless they do something wrong or upset her in some way. It’s not unknown for clients to stay attached to the same spa for years, if not decades. It’s important to offer clients the best and latest services to maintain this loyalty. Replacing your older pedicure chairs with new ones would offer your clients greater comfort. Modern chairs are more sophisticated than those available 10 or even 5 years ago. For example, some chairs no longer offer the vibration and rolling massages that feel jerky and clumsy. A modern pedicure chair has moved onto the human touch technology. They offer Shiatsu-like massages. These chairs offer your clients the best comfort and relaxation. Latest spa chairs are not just focused on the comfort of the customer; they also make the stylist’s job easier. Products from companies like Lenox or J&A offer convenience and ease of use to professionals. Sophisticated tools like pipeless jet systems or discharge pumps for chairs without access to plumbing, etc, can make your life much easier. With these chairs, your tools are always within hand’s reach and you can comfortably carry out the treatment. Needless to say, upgrading to a new pedicure chair makes sense. After all, they offer comfort to both you and your customers. If you have any questions about pedicure chairs and equipment, you’re free to contact us at Pedi Source. Just give us a call at 1855 429 PEDI. You can also email one of these two email address with your questions and contact details: info@Pedisource.com and James@Pedisource.com. It’s summer which means we’ll be seeing a lot more open-toed shoes and pedicures.Before picking a polish, consider this year’s hottest trends.While sitting in the massage chair, think about the sandals and flip flops you’ll wear throughout the season.Take into account the different social events you’ll attend as well.Then pick the polish that’s right for you.You may want to try one or two of the following hot colors for summer. The luxurious coral color looks great with any color of strappy sandal. It retails for $15.50 a bottle and is a favorite for pedicures.Bring a bottle with you when you visit the salon for your appointment. Who doesn’t love pink polish?It’s feminine and cheerful making it the perfect color for your summer wardrobe.You don’t need an excuse to be barefoot at the beach, do you?You won’t want to be after spending time in the pedicure chair.The nail lacquer retails for $9.50. Fancy designs of Mirror Stations and Deluxe Double Styling Station, available stylish face mirror. We have a complete line of hair equipment and furniture. Visit our online store for a huge variety of styling stations to choose from! 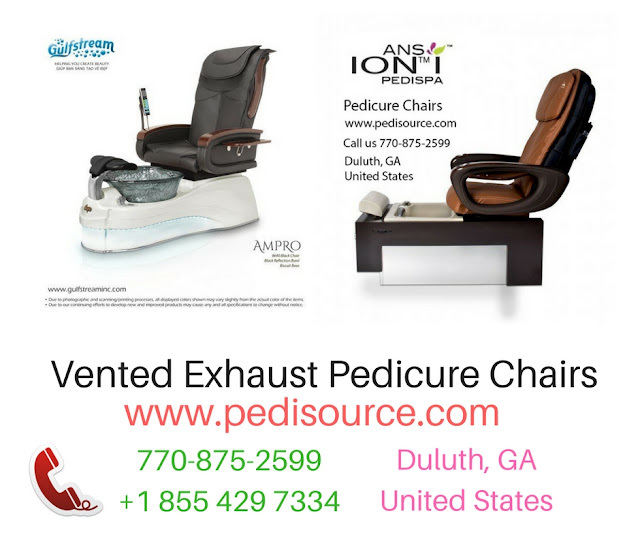 Pedisource features the largest selection of vented exhaust pedicure spa chairs, built in with ventilation exhaust systems to your wall or floor. Call now! 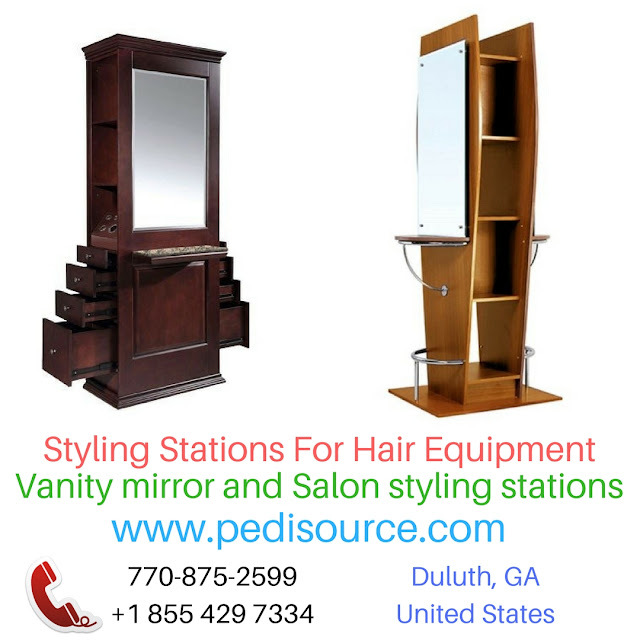 Wholesale Pedicure Chairs and Furniture sell direct by Pedisource.com, an American owned and operated in Duluth, GA. Lowest prices guarantee! Is the Decor of your Spa Important?